The evolutionary pressures placed by periods of famine shaped the physiology of most animals, including humans, toward a design that favors asymmetric food consumption. That is, most animals are “designed” to alternate between eating little and then a lot. Often when people hear this argument they point out the obvious. There is no evidence that our ancestors were constantly starving. This is correct, but what these folks seem to forget is that evolution responds to events that alter reproductive success rates (), even if those events are rare. If an event causes a significant amount of death but occurs only once every year, a population will still evolve traits in response to the event. Food scarcity is one such type of event. Since evolution is blind to complexity, adaptations to food scarcity can take all shapes and forms, including counterintuitive ones. Complicating this picture is the fact that food does not only provide us with fuel, but also with the sources of important structural components, signaling elements (e.g., hormones), and process catalysts (e.g., enzymes). In other words, we may have traits that are health-promoting under conditions of food scarcity, but those traits are only likely to benefit our health as long as food scarcity is relatively short-term. Not eating anything for 40 days would be lethal for most people. By "eating little" I don’t mean necessarily fasting. Given the amounts of mucus and dead cells (from normal cell turnover) passing through the digestive tract, it is very likely that we’ll be always digesting something. So eating very little within a period of 10 hours sends the body a message that is similar to the message sent by eating nothing within the same period of 10 hours. Most of the empirical research that I've reviewed suggests that eating very little within a period of, say, 10-20 hours and then eating to satisfaction in one single meal will elicit the following responses. Protein phosphorylation underlies many of them. - Your body will hold on to its most important nutrient reserves when you eat little, using selective autophagy to generate energy (, ). This may have powerful health-promoting properties, including the effect of triggering anti-cancer mechanisms. - Food will taste fantastic when you feast, to such an extent that this effect will be much stronger than that associated with any spice (). - Nutrients will be allocated more effectively when you feast, leading to a lower net gain of body fat (). - The caloric value of food will be decreased, with a 14 percent decrease being commonly found in the literature (). - The feast will prevent your body from down-regulating your metabolism via subclinical hypothyroidism (), which often happens when the period in which one eats little extends beyond a certain threshold (e.g., more than one week). - Your mood will be very cheerful when you feast, potentially improving social relationships. That is, if you don’t become too grouchy during the period in which you eat little. I recall once participating in a meeting that went from early morning to late afternoon. We had the option of taking a lunch break, or working through lunch and ending the meeting earlier. Not only was I the only person to even consider the second option, some people thought that the idea of skipping lunch was outrageous, with a few implying that they would have headaches and other problems. When I said that I had had nothing for breakfast, a few thought that I was pushing my luck. One of my colleagues warned me that I might be damaging my health irreparably by doing those things. Well, maybe they were right on both grounds, who knows? It is my belief that the vast majority of humans will do quite fine if they eat little or nothing for a period of 20 hours. The problem is that they need to be convinced first that they have nothing to worry about. Otherwise they may end up with a headache or worse, entirely due to psychological mechanisms (). There is no need to eat beyond satiety when you feast. I’d recommend that you just eat to satiety, and don’t force yourself to eat more than that. If you avoid industrialized foods when you feast, that will be even better, because satiety will be achieved faster. One of the main characteristics of industrialized foods is that they promote unnatural overeating; congrats food engineers on a job well done! If you are relatively lean, satiety will normally be achieved with less food than if you are not. Hunger intensity and duration tends to be generally associated with body weight. Except for dedicated bodybuilders and a few other athletes, body weight gain is much more strongly influenced by body fat gain than by muscle gain. On 13 April 2015 a full-day workshop on PLS-SEM will be conducted by Dr. Ned Kock, using the software WarpPLS. This workshop will be hands-on and interactive. To participate in the workshop, please indicate your interest when making your registration for the Symposium. Accepted submissions will be published in the online proceedings of the Symposium, subject to the following registration requirements. At least one of the authors listed for a presentation must register for the Symposium. Panels must have 3-5 participants, all of whom must register for the Symposium. Abstracts must have 150-500 words. Below is an example of submission. Using PLS in medical technology studies: What if I have only one group and one condition? What if a researcher obtains empirical data by asking questions to gauge the effect of a medical technology on task performance, but does not obtain data on the extent to which the medical technology is used? This characterizes what is referred to here as a scenario with one group and one condition, where the researcher is essentially left with only one column of data to be analyzed. When this happens, often researchers do not know how to analyze the data, or analyze the data making incorrect assumptions and using unsuitable techniques. Some of the PLS method’s features make it particularly useful in this type of scenario, such as its support for small samples and the use of data that does not meet parametric assumptions. The main goal of this presentation is to help medical technology researchers use the PLS method to analyze data in this type of scenario, where only one group and one condition are available. Two other scenarios are also discussed – a typical scenario, and a scenario with one group and two before-after technology introduction conditions. While the focus here is on medical technology use, the recommendations apply to many other fields. Standard lipid profiles provide LDL cholesterol measures based on equations that usually have the following as their inputs (or independent variables): total cholesterol, HDL cholesterol, and triglycerides. Yes, LDL cholesterol is not measured directly in standard lipid profile tests! This is indeed surprising, since cholesterol-lowering drugs with negative side effects are usually prescribed based on estimated (or "fictitious") LDL cholesterol levels. The most common of these equations is the Friedewald equation. Through the Friedewald equation, LDL cholesterol is calculated as follows (where TC = total cholesterol, and TG = triglycerides). The inputs and result are in mg/dl. Here is one of the problems with the Friedewald equation. Let us assume that an individual has the following lipid profile numbers: TC = 200, HDL = 50, and trigs. = 150. The calculated LDL will be 120. Let us assume that this same individual reduces triglycerides to 50, from the previous 150, keeping all of the other measures constant with except of HDL, which goes up a bit to compensate for the small loss in total cholesterol associated with the decrease in triglycerides (there is always some loss, because the main carrier of triglycerides, VLDL, also carries some cholesterol). This would normally be seen as an improvement. However, the calculated LDL will now be 140, and a doctor will tell this person to consider taking statins! There is evidence that, for individuals with low fasting triglycerides, a more precise equation is one that has come to be known as the “Iranian equation”. The equation has been proposed by Iranian researchers in an article published in the Archives of Iranian Medicine (Ahmadi et al., 2008), hence its nickname. Through the Iranian equation, LDL is calculated as follows. Again, the inputs and result are in mg/dl. The Iranian equation is based on linear regression modeling, which is a good sign, although I would have liked it even better if it was based on nonlinear regression modeling. The reason is that relationships between variables describing health-related phenomena are often nonlinear, leading to biased linear estimations. With a good nonlinear analysis algorithm, a linear relationship will also be captured; that is, the “curve” that describes the relationship will default to a line if the relationship is truly linear (see: warppls.com). Anyway, an online calculator that implements both equations (Friedewald and Iranian) is linked here; it was the top Google hit on a search for “Iranian equation LDL” at the time of this post’s writing. As you will see if you try it, the online calculator linked above is useful in showing the difference in calculated LDL cholesterol, using both equations, when fasting triglycerides are very low (e.g., below 50). The Iranian equation yields high values of LDL cholesterol when triglycerides are high; much higher than those generated by the Friedewald equation. If those are not overestimations (and there is some evidence that, if they are, it is not by much), they describe an alarming metabolic pattern, because high triglycerides are associated with small-dense LDL particles. These particles are the most potentially atherogenic of the LDL particles, in the presence of other factors such as chronic inflammation. In other words, the Iranian equation gives a clearer idea than the Friedewald equation about the negative health effects of high triglycerides. You need a large number of small-dense LDL particles to carry a high amount of LDL cholesterol. An even more precise measure of LDL particle configuration is the VAP test; this post has a discussion of a sample VAP test report. Ahmadi SA, Boroumand MA, Gohari-Moghaddam K, Tajik P, Dibaj SM. (2008). The impact of low serum triglyceride on LDL-cholesterol estimation. Archives of Iranian Medicine, 11(3), 318-21. Should you drink your coffee filtered? Coffee is one of the most widely consumed beverages in the world. Arguably a key reason for this is that coffee has psychoactive properties that we may be hardwired to value, even if subconsciously. For example, it increases alertness; possibly a fitness-enhancing effect in our evolutionary past. Here the term “fitness” in “fitness-enhancing effect” means “reproductive success”, and does not mean having great athletic ability or having shredded abs. The two most common sources of coffee beans, which are roasted and ground prior to brewing, are the widely favored Coffea arabica, and the "robusta" form Coffea canephora. The arabica form accounts for 80 percent or so of world consumption. The graph below, from a study by Bonita and colleagues (), shows the per capita consumption of coffee in various countries. As you can see, Scandinavian countries are big consumers. Most people probably drink filtered coffee. However, there are many unfiltered coffee preparation methods that are also widely used. Greek coffee, Turkish coffee, coffee prepared with a French press, and “cowboy coffee” are all unfiltered. 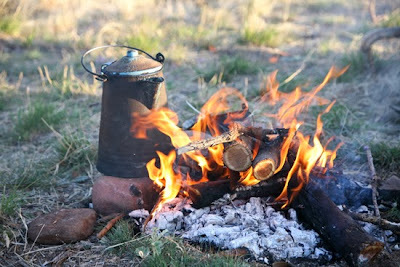 In the photo below (from: Goldenstate.wordpress.com), illustrating cowboy coffee, note that the coffee pot is placed near but not over the fire. What is “cowboy coffee”? This method of preparation has many variations. A simple one involves mixing ground coffee with hot water, and then keeping the coffee simmering on very low fire for a while. It is called cowboy coffee due to its association with coffee drank by cowboys around a campfire. After brewed, coffee tends to rise and spill out of the pot if heated at a high temperature. To avoid this, one should turn off the fire just prior to the coffee boiling, heat the coffee in a pot on very low fire, or heat the coffee by placing the pot near but not too close to a campfire. The same is generally true for tea. With cowboy coffee you need significantly less coffee per measure of water, and the coffee ends up with a stronger flavor – if prepared properly. You also keep two key oily components of the coffee, namely the diterpenes known as kahweol and cafestol; its polyphenols, most notably chlorogenic acid; and some of the coffee particles. Both kahweol and cafestol seem to be associated with reduction in certain types of cancer in humans, and show strong anti-cancer effects in rats (). The same seems to be generally true for chlorogenic acid (). The coffee particles, if ingested, would probably be treated as indigestible fiber and promote colon health. This is usually the fate of indigestible and partially digestible plant matter. Why is filtered coffee often recommended? Well, unfiltered coffee is believed to promote heart disease. But that is not primarily due to any strong association having been found between unfiltered coffee consumption and heart disease. In fact, the absence of evidence in favor of this hypothesis in long-term studies is rather conspicuous (). The belief that unfiltered coffee can promote heart disease is due to evidence showing that consumption of 4 cups per day of unfiltered coffee raises total cholesterol by up to 10 mg/dl (). Only diehard proponents of the lipid hypothesis would look at total cholesterol increase as a marker of heart disease, in part because total cholesterol may increase due to an increase in HDL cholesterol – a much more reliable marker, but of protection against heart disease, particularly within certain ranges. And yes, unfiltered coffee consumption is associated with an increase in HDL cholesterol (). Moreover, some of the metabolites of caffeine, 1-methyxanthine and 1-methyluric acid, appear to help prevent LDL oxidation; caffeine metabolites also seem to have potent anti-inflammatory properties (). Some research provides evidence of the importance of moderation in coffee consumption as an important factor in its relationship with health. In this respect, coffee is like almost anything that can be ingested, including water – the dose makes the poison. In a study of 40,000 post-menopausal women in the US reviewed by Bonita and colleagues (), the hazard ratio of death attributed to heart disease was 0.76 for consumption of 1–3 cups/day, 0.81 for 4–5 cups/day, and 0.87 for ≥6 cups/day. Interestingly, the same study reported that the hazard ratio for death from other inflammatory diseases was 0.72 for consumption of 1–3 cups/day, 0.67 for 4–5 cups/day, and 0.68 for ≥6 cups/day. Frequently you hear about the possible connection between coffee consumption and gastritis. The most widely cited study I could find that looked into this link found no association between coffee consumption and reflux-associated gastritis (). By the way, if you have gastritis, you should consider getting tested for Helicobacter pylori (), especially if you like eating raw fish. Stress and coffee consumption may have similar effects in those who test positive for Helicobacter pylori (see, e.g., ). In those individuals, past research has found a link between: (a) stress, coffee consumption, and other purported “stomach irritants”; and (b) exacerbation of gastritis symptoms, stomach ulcers, and stomach cancer. This discussion on gastritis is largely unrelated to the issue of drinking unfiltered coffee. It is unclear based on the past studies that I reviewed whether coffee filtration has anything to do with any possible connection between coffee consumption and exacerbation of gastritis symptoms caused by other factors. As a side note, it is important to keep in mind that the acidity of coffee is nowhere near the acidic of gastric acid, which the stomach is uniquely designed to handle. I may be wrong, but from what I can see, if you drink coffee regularly and it causes no problems for you, drinking unfiltered coffee is not a bad idea at all. Can consumption of sweet potatoes cause hypervitaminosis A? The answer is “no”, even if you eat ten or more sweet potatoes per day. Sweet potatoes do have high vitamin A content, more than almost any other food. However, most of it is in the form of β-carotene, which is used by the body to produce the active form of vitamin A, retinal (yes, with an “a”), only if the body’s vitamin A status is low. 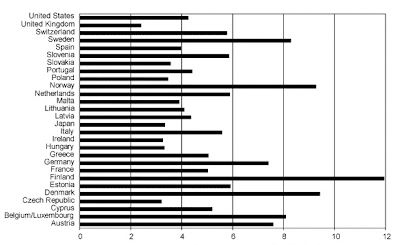 The graph below shows the vitamin A content of different foods, together with the recommended daily allowance. It was prepared with information from Nutritiondata.com (), with the horizontal axis in international units (). The graph also takes into consideration some key research findings related to the bioavailability of vitamin A. For example, the sweet potato is assumed to be taken with some fat to facilitate the absorption of vitamin A. Primarily, vitamin A is available either as retinol, from animal foods; or β-carotene, from plant foods. There are other carotenes available from plant foods, but their vitamin A contribution is relatively small compared with β-carotene. High β-carotene content is “advertised” by plant foods to animals via a characteristic orange color. The main sources of β-carotene throughout human evolution have probably been fruits, which plants “want” animals to eat so that the plants’ seeds are dispersed. Retinol also needs to be converted by the body to retinal, and when consumed in excess it tends to be stored in body fat reserves – hence lean individuals tend to store less retinol than fat ones. It seems that intake of retinol from sources like beef liver is naturally controlled via satiety. In the case of plant sources, like sweet potatoes, a key control mechanism is limited internal production of retinal. My impression is that most people, if given the chance, would prefer to eat a lot of sweet potato than a lot of beef liver. Like all of the fat-soluble vitamins, the bioavailability of vitamin A from foods is dependent on whether they are consumed together with fat. For example, a lot more vitamin A will be absorbed from a sweet potato if it is eaten with butter than if it is eaten by itself (again, if the body’s vitamin A status is low). I should note that butter is itself a good source of vitamin A, in addition to providing the fat needed for absorption. Beef liver is low in fat, which means that the vitamin A content in the graph above may be an overestimation. Hypervitaminosis is a fat-soluble vitamin phenomenon, and it is usually associated with consumption of supplements (e.g., cod liver oil). Generally speaking, one does not develop noticeable hypervitaminosis symptoms from consumption of natural food sources. This is probably due to a combination of satiety and internal regulation of the production of the active forms of the vitamins. Cardiovascular diseases are currently the leading cause of death in most developed countries. They are particularly common among seniors; i.e., those aged 65 and older. Part of the reason for this is that infectious diseases do not kill as many people as they used to. Given the trend toward population aging, with seniors making up an increasingly larger percentage of the population, the market for drugs against cardiovascular diseases is growing. A new class of such drugs is making the news lately; they target the PCSK9 enzyme (). Enzymes are (usually) proteins that speed up chemical reactions, and are needed in virtually all metabolic processes that occur in cells. Proprotein convertase subtilisin/kexin type 9 (PCSK9) is an enzyme that degrades LDL cholesterol receptors on the surface of liver cells. Fewer LDL cholesterol receptors mean reduced uptake of the particles that carry LDL cholesterol, and thus more LDL particles in circulation. This may be problematic if these are small-dense LDL particles (). Small-dense LDL particles include particles that are significantly smaller than the gaps in the endothelium (). The endothelium is a thin layer of cells that line the interior of arteries. Those gaps are about 25-26 nanometers (nm) in diameter. Small-dense LDL particles can contribute a lot more to the formation of atheromas (atherosclerotic plaques) in predisposed individuals than large-buoyant LDL particles. There is evidence of the natural occurrence of low LDL cholesterol in individuals of African descent due to genetic mutations influencing PCSK9 levels (). This leads us to a very important question. By reducing PCSK9 in circulation, can we also reduce the incidence of cardiovascular disease? The answer to this question depends on whether LDL cholesterol is a causative factor in cardiovascular disease. If it is, then reducing PCSK9 in circulation can indeed reduce the incidence of cardiovascular disease. The problem is that, most of the evidence so far suggests that LDL cholesterol is NOT a causative factor in cardiovascular disease. Yes, there are studies that show that LDL cholesterol is correlated with cardiovascular disease, but the problem is that LDL cholesterol is a marker of other factors that are better candidates for causes of cardiovascular disease – hence the correlation. For example, LDL cholesterol goes up with mental stress (), and chronic mental stress seems to be a good candidate for a cause of cardiovascular disease. LDL cholesterol is also a marker of a diet with more saturated fat in it (). In many contexts, a diet with more saturated fat in it is a more nutritious diet, which leads to a negative association between LDL cholesterol and mortality. The graph below shows the shape of the association between total cholesterol (TOTCHOL) and mortality from all cardiovascular diseases (MVASC), based on an analysis of the China Study II dataset (). LDL cholesterol is the main component of total cholesterol in most people. The values are provided in standardized format; e.g., 0 is the average, 1 is one standard deviation above the mean, and so on. The best-fitting curve was obtained with the software WarpPLS (). - There was no association between LDL cholesterol level and risk of fatal cardiovascular disease. - A low HDL cholesterol level was associated with a two-fold higher risk of fatal cardiovascular disease. - Both low LDL cholesterol and low HDL cholesterol levels were associated with an increased mortality risk from infections. The results above are particularly interesting because the study participants, given their ages, were at a high risk of mortality from cardiovascular diseases. It seems that the best scenario for these folks would have been a concomitant increase in both LDL and HDL cholesterol levels, which seems to be exactly what happens when one increases his or her intake of foods rich in saturated fat and dietary cholesterol ()! Should you take a drug that targets the PCSK9 enzyme, to reduce your LDL cholesterol? Maybe you should ask Peter (). The traditional Inuit diet is very high in animal protein and fat. It also includes plant matter. Typically it is made up primarily of the following: fish, walrus, seal, whale, berries, and fireweed (of which syrups and jellies can be made). Kjærgaard and colleagues (see under References, at the end of this post) examined data from an Inuit population in Greenland from 1962 to 1964, prior to the heavy westernization of their diet that is seen today. They investigated 96.9% of the whole population in three areas, including Ammassalik in East Greenland (n = 1,851). Of those, only 181 adults, or 9.7 percent, had anything that looked like an abnormality that could suggest ischemia. This included ventricular hypertrophy (an enlargement of the heart chambers), leading to an overestimation because benign ventricular hypertrophy is induced by continuous physical exertion. These 181 adults were then selected for further screening. Benign ventricular hypertrophy is also known as athlete's heart, because it is common among athletes. A prevalence of ventricular hypertrophy at a relatively young age, and declining with age, would suggest benign hypertrophy. The opposite would suggest pathological hypertrophy, which is normally induced by chronic hypertension. As you can see from the figure below, from Kjærgaard et al. (2009), the pattern observed among the Inuit was of benign hypertrophy, suggestive of strong physical exertion at a young age. A pattern of benign hypertrophy induced by robust physical activity is also consistent with reports by Stefansson (1958) about the life of the Eskimos in Northern Alaska. It is reasonable to assume that these Eskimos had a diet and lifestyle similar to the Greenland Inuit. Back to Kjærgaard et al.’s (2009) study. The 181 adults selected for further screening then had a 12-lead ECG performed (this is a widely used test to check for heart abnormalities). The results suggested that only two men, aged 62 and 63 years, had ischemic heart disease. All in all, this suggests a prevalence of ischemic heart disease of 0.11 percent, which is very low. The prevalence of ischemic heart disease in the US of approximately 6.8 percent. That is, the prevalence in the US is 63 times higher than among the Inuit studied (using the 0.11 percent as the basis for comparison). And, it should be noted that there are many countries with a higher prevalence of ischemic heart disease than modern US. It is possible that the low prevalence of ischemic heart disease among the Inuit was partly due to a higher mortality of those with the disease than in modern US, where medical intervention can prolong one's life in the presence of almost any disease. That is, perhaps many of those Inuit with ischemia would die quickly, and thus would not be captured by a study like this. It is doubtful, however, that this would explain a difference as large as the one observed. Moreover, if many Inuit were dying due to ischemia, there would probably be plenty of evidence suggesting that. (I would imagine that the mysterious deaths associated with chest pain, and other related symptoms, would be a constant topic of conversation.) Reports from early explorers, however, suggest the opposite (e.g., Stefansson, 1958), and are consistent with the study described here. In conclusion, this study suggests that the diet and lifestyle of the Greenland Inuit prior to the 1960’s (i.e., not their traditional diet and lifestyle, but approaching it) could be seen today as heart-healthy (at least for them), even though the Greenland Inuit ate a lot of animal protein and fat. Kjærgaard, M., Andersen, S., Holten, M., Mulvad, G., Kjærgaard, J.J. (2009). Low occurrence of ischemic heart disease among Inuit around 1963 suggested from ECG among 1851 East Greenland Inuit. Atherosclerosis, 203(2), 599-603. Stefansson, V. (1958). Eskimo longevity in Northern Alaska. Science, 127(3288), 16-19. High-density lipoprotein (HDL) is one of the five main types of lipoproteins found in circulation, together with very low-density lipoprotein (VLDL), intermediate-density lipoprotein (IDL), low-density lipoprotein (LDL), and chylomicrons. After a fatty meal, the blood is filled with chylomicrons, which carry triglycerides (TGAs). The TGAs are transferred to cells from chylomicrons via the activity of enzymes, in the form of free fatty acids (FFAs), which are used by those cells as sources of energy. After delivering FFAs to the cells, the chylomicrons progressively lose their TGA content and “shrink”, eventually being absorbed and recycled by the liver. The liver exports part of the TGAs that it gets from chylomicrons back to cells for use as energy as well, now in the form of VLDL. As VLDL particles deliver TGAs to the cells they shrink in size, similarly to chylomicrons. As they shrink, VLDL particles first become IDL and then LDL particles. The figure below (click on it to enlarge), from Elliott & Elliott (2009; reference at the end of this post), shows, on the same scale: (a) VLDL particles, (b) chylomicrons, (c) LDL particles, and (d) HDL particles. The dark bar at the bottom of each shot is 1000 A in length, or 100 nm (A = angstrom; nm = nanometer; 1 nm = 10 A). As you can see from the figure, most of the LDL particles shown are about 1/4 of the length of the dark bar in diameter, often slightly more, or about 25-27 nm in size. They come in different sizes, with sizes in this range being the most common. The smaller and denser they are, the more likely they are to contribute to the formation of atherosclerotic plaque in the presence of other factors, such as chronic inflammation. The larger they become, which usually happens in diets high in saturated fat, the less likely they are to form plaque. Note that the HDL particles are rather small compared to the LDL particles. Shouldn’t they cause plaque then? Not really. Apparently they have to be small, compared to LDL particles, to do their job effectively. HDL is a completely different animal from VLDL, IDL and LDL. HDL particles are produced by the liver as dense disk-like particles, known as nascent HDL particles. These nascent HDL particles progressively pick up cholesterol from cells, as well as performing a number of other functions, and “fatten up” with cholesterol in the process. This process also involves HDL particles picking up cholesterol from plaque in the artery walls, which is one of the reasons why HDL cholesterol is informally called “good” cholesterol. In fact, neither HDL nor LDL are really cholesterol; HDL and LDL are particles that carry cholesterol, protein and fat. As far as particle size is concerned, LDL and HDL are opposites. Large LDL particles are the least likely to cause plaque formation, because LDL particles have to be approximately 25 nm in diameter or smaller to penetrate the artery walls. With HDL the opposite seems to be true, as HDL particles need to be small (compared with LDL particles) to easily penetrate the artery walls in order to pick up cholesterol, leave the artery walls with their cargo, and have it returned back to the liver. Interestingly, some research suggests HDL particles that are larger in size, when compared with other HDL particles (not with LDL particles), seem to do a better job than very small HDL particles in terms of reducing risk of cardiovascular disease. It is also possible that a high number of larger HDL particles in the blood is indicative of elevated levels of "effective" HDL particles; i.e., particles that are effective at picking up cholesterol from the artery walls in the first place. Another interesting aspect of this cycle is that the return to the liver of cholesterol picked up by HDL appears to be done largely via IDL and LDL particles (Elliott & Elliott, 2009), which get the cholesterol directly from HDL particles! Life is not that simple. William H. Elliott & Daphne C. Elliott (2009). Biochemistry and Molecular Biology. 4th Edition. New York: NY: Oxford University Press. The idea that heavy physical activity is a main trigger of heart attacks is widespread. Often endurance running and cardio-type activities are singled out. Some people refer to this as “death by running”. Others think that strength training has a higher lethal potential. We know based on the Oregon Sudden Unexpected Death Study that this is a myth (). Here is some evidence that heavy physical activity in fact has a significant protective effect. The graph below shows the number of deaths from coronary heart disease, organized by age group, in longshoremen (dock workers). 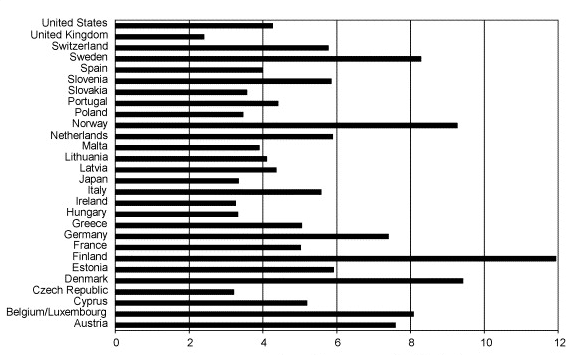 The shaded bars represent those whose level of activity at work was considered heavy. The unshaded bars represent those whose level of activity at work was considered moderate or light (essentially below the “heavy” level). The data is based on an old and classic study of 6351 men, aged 35 to 74 years, who were followed either for 22 years, or to death, or to the age of 75. It shows a significant protective effect of heavy activity, especially after age 45 () . The numbers atop the unshaded bars reflect the relative risk of death from coronary heart disease in each age group. For example, in the age group 65-74, the risk among those not in the heavy activity group is 110 percent higher (2.1 times higher) than in the heavy activity group. Heavy physical activity may not make you lose much weight, but has the potential to make you live longer. A viral cure for cancer only a few years away? Adopting an evolutionarily sound lifestyle may reduce the probability that one will develop cancer, but there will be those who will nevertheless have cancer. As we live longer lives, cancer diagnoses are likely to become more and more common. There are viruses that cause the formation and growth of cancer tumors: oncoviruses. However, and quite interestingly, there are also viruses that seek and kill cancer cells: oncolytic viruses. The video below discusses emerging treatments based on oncolytic viruses. Cancer treatment via oncolytic viruses had a promising start in the mid-1990s. However, due to technical complications it has been sidelined for years. Interest has been picking up dramatically in recent years. Could it be foundation for the long promised cure for cancer, as the video implies? What is the probability that you are NOT diabetic if your fasting blood glucose is 110-126 mg/dl? Often I hear from readers who have changed their diets and lifestyles toward a more evolutionarily sound direction () that their fasting blood glucose (FBG) readings have gone up. Frequently numbers in the range 110-126 mg/dl (6.1-7 mmol/l) are mentioned. If you have a FBG reading of 110-126 mg/dl (6.1-7 mmol/l) very likely your doctor will tell you that you are either diabetic or well on your way be becoming diabetic. Diabetes is a condition that in humans is most frequently associated with damage to the beta cells in the pancreas, significantly impairing insulin secretion. With limited insulin, glucose levels tend to go up, leading to high FBG levels and high glucose peaks after consumption of carbohydrates. The latter, high glucose peaks, appear to be particularly damaging when happening regularly over time. What is the probability that you are NOT diabetic with this FBG reading? I put together the table below, based on data from a widely cited meta-analysis () conducted by the research group called The Emerging Risk Factors Collaboration. It shows the distribution of FBG levels in urban settings among individuals who do not have diabetes. The numbers in this table are fairly consistent with those from various other surveys of large numbers of individuals in urban settings. The study mentioned above also tells us that the incidence of diabetes in urban populations is in the neighborhood of 6.8 percent. This may not sound like much, but as disease incidences goes, it is very high – approximately 1 in every randomly selected group of 15 people has diabetes. The vast majority of those diagnosed will have diabetes mellitus type 2, which tends to develop over time and be associated with the metabolic syndrome (). In the equation above, P(B|A) is the probability of event B given A, P(A) is the probability of event A, and P(B) is the probability of event B. To answer the question posed in the title of this blog post, we need to calculate the probability that a person will have no diabetes given that he or she has a fasting blood glucose of 110-126 mg/dl. From the table above we know that P(FBG=110-126 mg/dl|NoDiabetes)=7 percent. From our previous discussion, we know that P(NoDiabetes)=(100-6.8)/100 =93.2 percent. Finally, the study tells us that P(FBG=110-126 mg/dl) is 9.1 percent. This includes individuals with diabetes (2.1 percent) and without diabetes (7 percent). That is, if your fasting blood glucose is in the 110-126 mg/dl range (6.1-7 mmol/l) then the probability that you DO NOT have diabetes is 72 percent. It would be much safer to bet that you do not have diabetes than that you do, even at that relatively high range. The above discussion not only highlights the lack of reliability of fasting blood glucose levels for diabetes diagnoses in the 110-126 mg/dl range (6.1-7 mmol/l), but also begs the question – what could cause high fasting blood glucose levels in healthy individuals? Some of the folks I heard from have gone through insulin sensitivity tests (see, e.g., ), and were found to be insulin sensitive (in at least one case, highly sensitive), even though their baseline glucose levels are generally high. This goes against the possible speculation that they are prediabetics well on their way to becoming diabetic. One possibility has been discussed in a previous post, which also mentions what could happen with HbA1c levels (). The figure below, from Brooks et al. 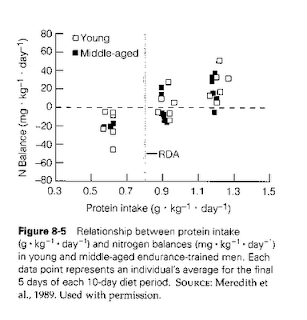 (2005), shows a graph relating nitrogen balance and protein intake. A nitrogen balance of zero is a state in which body protein mass is stable; that is, it is neither increasing nor decreasing. It seems that the graph was taken from this classic study by Meredith et al. The participants in the study were endurance exercisers. As you can see, age is not much of a factor for nitrogen balance in this group. The above numbers are overestimations of the amounts needed by people not doing endurance exercise, because endurance exercise tends to lead to muscle loss more than rest or moderate strength training. One way to understand this is compensatory adaptation; the body adapts to endurance exercise by shedding off muscle, as muscle is more of a hindrance than an asset for this type of exercise. The excess protein will be used primarily as fuel; that is, it will be oxidized. In fact, a large proportion of all the protein consumed on a daily basis is used as fuel, and does not become muscle. This happens even if you are a gifted bodybuilder that can add 1 lb of protein to muscle tissue per month. So excess protein can make you gain body fat, but not by protein becoming body fat. Wilson, J., & Wilson, G.J. (2006). Contemporary issues in protein requirements and consumption for resistance trained athletes. Journal of the International Society of Sports Nutrition, 3(1), 7-27.